During those 1960 Olympics, a 22-year-old American woman—the only female alpine athlete earning multiple medals—was cast into the artificial light of live TV cameras. Her name was Penny Pitou. Fast-forward to this week and another 22-year-old American women could also be the only two-event winner at Squaw Valley. In doing so she would capture her fourth slalom title, have a real shot at beating Tessa Worley (FRA) for the GS title, and distance herself from this season's rising star and speed specialist, Ilka Stuhec (SLO), to become the overall women's World Cup champion. Her name is Mikaela Shiffrin. Another woman, also a former Olympian and Squaw Valley champion, winning the 2103 U.S. National slalom title, knows this track well and what it takes to win there. Recently retired after nine seasons with the Canadian Ski Team, she moved to the Tahoe area where she now coaches at Squaw Valley. Her name is Anna Goodman. POWDER spoke with 'Goody' about her racing experience at Squaw Valley, the track, and what to expect from the World Cup women in the upcoming GS race on March 10 and slalom on March 11. Squaw Valley is abuzz with World Cup fever. Whether it's about the weather, the hill preparation or speculation on winners, everyone seems to be talking about the upcoming World Cup races. It's not just another race; there's serious money on the line and these are the last World Cup tech races of a six-month-long season before World Cup Finals next week in Aspen. These two races are supremely important for the women for two big reasons: overall titles and qualifications for World Cup Finals (only the top 25 ranked skiers in each discipline qualify for the World Cup Finals). North American World Cup athletes have been on the road since October, so for them to race on 'home soil' is rare and a nice bonus at the end of the season. But this year home soil is covered under 600 inches of snow. 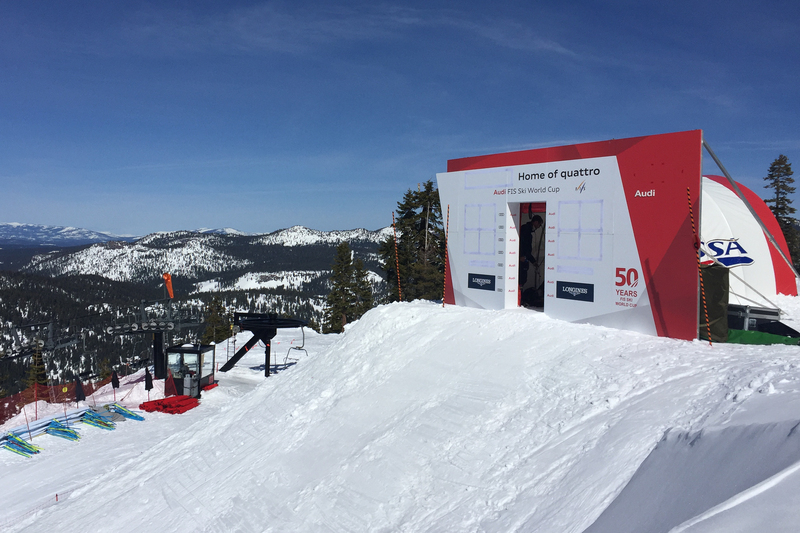 To provide a fair track in Squaw Valley, the surface needs to hold up to 60-plus racers per run. As a result, 'Dog Leg,' the race hill, has been watered with the hope of creating what the athletes like: a rock-solid surface. The Dog Leg lives up to its name. It's a turny and steep hill. After a slow ride up the Red Dog triple chair, athletes immediately arrive at the start of the Giant Slalom course. With a flat cat-track out of the gate, the trail abruptly takes a dive to the right, this where the real excitement begins. Early start numbers have a bigger-than-normal advantage for both races. When I raced here during the 2013 U.S. Nationals, we had spring conditions and course workers had to salt the track to keep the surface firm. The toughest part of these races will be keeping the track surface conditions consistent from the first racer to the last. With the technical aspects of the slalom and the grueling nature of the giant slalom, the Dog Leg should benefit Shiffrin. She has the fitness and ability to challenge Tessa Worley for the GS win and is the favorite for the slalom. What's unique about Shiffrin is her ability to pull her greatest margins in the last twenty seconds of the run. The GS race will be won or lost in the first 20 to 40 seconds. For the women, this section will be the most technical because of two blind break-overs (turns) onto steep terrain. Negotiating blind drop-offs with aggressive compressions in potentially marginal conditions will separate the winners from the rest of the pack. The only saving grace is that there is no real flat section to this course, so no matter how many mistakes athletes make they can still recover speed and salvage a decent run. One interesting thing about this World Cup track versus a normal track is that rollers have been built into the final section of the course. In contrast to the GS, the slalom track at Squaw will be similar to other courses on tour. Actually, the race hill is very similar to the terrain of Flachau, Austria; it's relatively steep the entire way, it has rollers, and you can see the finish line from the start. The slalom will be an all-out sprint for racers. Spectators will enjoy the slalom set at Squaw, but athletes will need to attack the entire course because there are no real defining terrain changes or technical aspects that create large time differences within the pack. Third time's a charm. In two previous appearances at Squaw Valley for U.S. Nationals, Shiffrin has struggled in the slalom events. However, she did win the GS title in 2014, and given her ability to find another gear for the big events, Shiffrin's third trip to Squaw could set her up for three World Cup titles: slalom, giant slalom, and the overall World Cup Globe.